Last weekend, I found myself descending down a rope without being able to see the top of it, or the bottom. I moved down slowly, steadily, one had below the other – unsure what I was heading towards or how much further I had to go before reaching my destination. I couldn’t see more than a couple of metres above me, below me, around me – everything beyond was milky and still. I had no way of communicating, the only sound I could hear was that of my breath: deep, Darth Vader-like, echoing around my skull as I tried to keep it even. It was one of the most disorientating, unnerving and otherworldly places I had ever been in – and the most astonishing thing was that it was just a couple of hours away from home, in the UK. 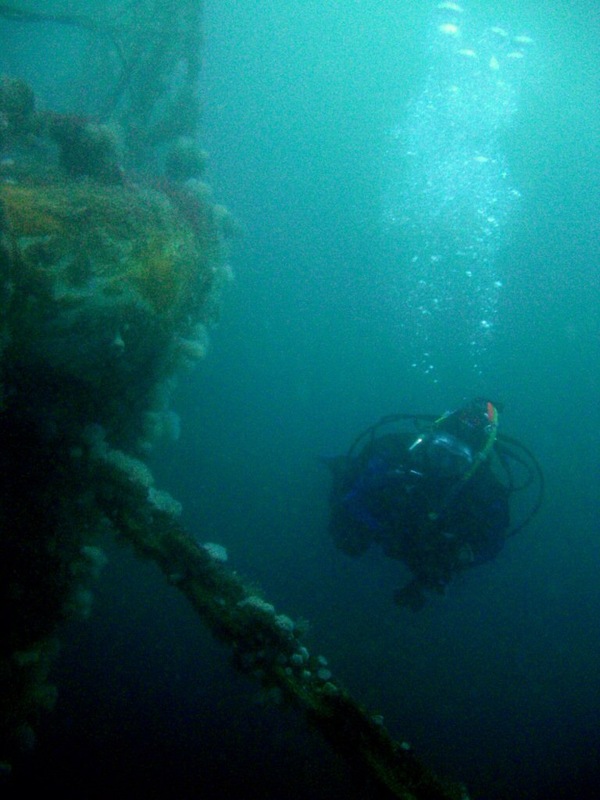 This was my first real experience of scuba diving, and I was heading down 14 metres to the wreck of a fishing boat in Swanage, Dorset. 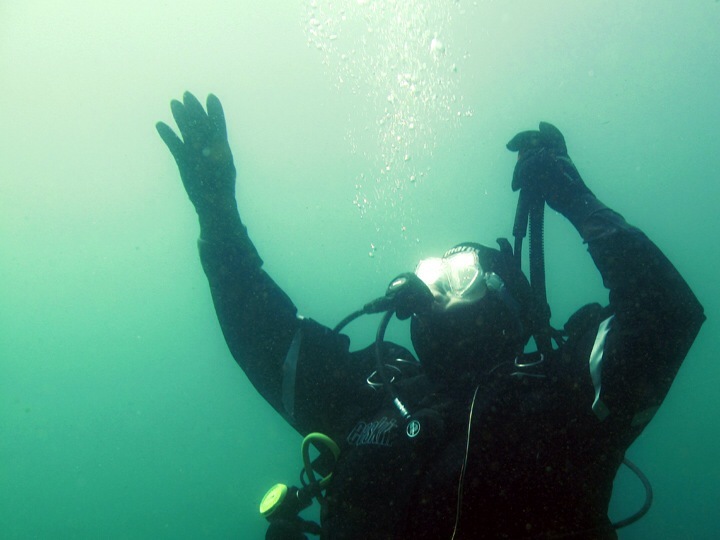 I’d had plenty of preparation – including weekly dive sessions in the local pool and seven lectures on the theory of diving, including everything from underwater navigation to how to stop your lungs from exploding when you ascend. I’d even done a few shallow dives under Swanage pier – in water barely deeper than the pool, but with currents, rocks and stray fishing lines to contend with. But I don’t think anyone can ever be prepared for their first proper dive. I was in the water with my dive buddy, Tom – who had been diving pretty much since the sport was invented, and who I trusted – quite literally – with my life, but underwater, you cannot talk. I’ve done a few scary things before, but have always been able to tell someone – this is scary! Which is sometimes all you need. Robbed of the ability to speak, my mind was left to wander, and thoughts of exploding lungs, nitrogen narcosis and fishing net entanglement bubbled away in the watery void. As the rusted wreck finally emerged from the sediment, I tried to sort out my buoyancy; experienced divers hate it when the newbies kick up the silt and ruin it for everyone else. But as I rose gently from the seabed, I became utterly paranoid that I would shoot up to the surface, and gripped onto the wreck, never letting go with both hands, ever. I also wanted to stay within emergency grabbing distance of Tom, and managing the two took up most of my concentration – I wasn’t paying any attention to the wreck, or the fish, or the general incredibleness of what was around me: I was 14 metres underwater! And breathing! I then glanced at how much air I had used, and it was about twice as much as I’d thought – I had to get the anxiety under control or this dive would have to be cut short. After a while, Tom found the rope at the end of the wreck and we pulled ourselves along it to a second boat, a few metres away, but completely invisible from the first. I began to relax, and realise I wasn’t going to float to the surface, or drift off. The water at this depth was far calmer than under the pier, and the weight of it kept me rooted. As we approached the second wreck, Tom stopped and pointed – a shoal of fish hovered in the water, and we hovered too, just a couple of metres from them. This was amazing. The second boat was all smashed up wood – a cooler wreck, and I felt confident enought not to grip the sides of it as we swam around it, twice. We saw the rusted propeller, and played with a crab. We had the whole wreck to ourselves – none of the other divers had come across the rope yet; this was Tom’s experience coming into play. By the time I’d decided I loved scuba diving, it was time to head back up. Slowly, slowly, we ascended the rope, and the water above our heads flooded with light as we travelled towards the sun. We dangled at six metres for our safety stop, calm, unhurried, then floated gently to the surface, where the underwater world, which had stretched just a couple of metres around me, sudenly opened up into the vast horizon of the ocean. Buffeted by waves, we signalled to the boat and it came to collect us. As the dive lift hauled me out of the saltwater I was once again weighed down by lead and steel and three layers of wet neoprene, staggering across the deck on my fins, a lumbering sea lion that, just minutes before, had been gliding, streamlined, through the water. I was trembling with the weight, and the physical exhaustion, and the adrenaline – I did it! – and Tom was delighted. Regulators out, masks off, we could finally speak to each other. “That was the perfect dive!” said Tom, delighted. But hving wanted to communicate for so long, I was momentarily lost for words. Time had contracted and expanded beneath the surface, it was a space without time and I had no idea how long we’d been down; it turned out to be 40 minutes. A long time to be underwater, with just the sound of your own breath, and no way of communicating your anxiety or amazement. A short time to be transported into another world, one in which I wasn’t designed to survive, and one which few people will experience – but one which I would very much like to visit again. Tags: england, scuba diving. Bookmark the permalink.